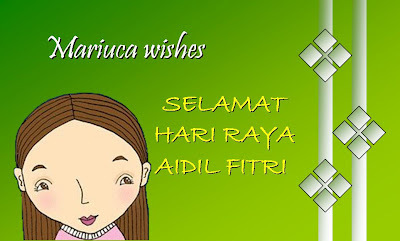 Here's wishing all my Muslim friends in Malaysia and all over the world a very Happy Hari Raya! Especially to DD & Helmy, Elina, Yasmin & Shariz, Zue & MG, Sher, TSZ, Comel, Hans, Zeff, Zubli, Emila, Izali, Mixterr, Reda, LadyJava, NAFA, Joezul, Forumer, Nihal, Jacques Pierre Alan Zain & Yasmin. Selamat Hari Raya Aidilfitri & Maaf Zahir Batin. Have a blessed Aidilfitri with your family and friends. Enjoy the Raya goodies, have loads of fun and we'll meet here again soon! Oh and drive safely to your Raya destination! Selamat Hari Raya GP and everyone! Kalau ada salah silap sepanjang mana persahabatan kita, I pohon ampun dan maaf yek. No lah.. no kampung.. my IL all here..easy easy...hehe..
Pls hop over my place to get ur dozen of ROSES to celebrate ur HARI RAYA!!! Have an enjoyable long weekend with B.
Wishing you a joyous festival and enjoy yourself to the max. Makan banyak banyak, Put on a few kilo pun tak apa. heheheh. Safe and pleasant journey home if you balik kampung. Marzie! I left you a message yesterday but I don't see it here so I'm gonna wish you again.. Please forgive us for anything that we had done wrong. After all, we are humans and we make mistakes. May this festive season bring peace, joy and love among us all, and may all of u have a blissful Raya with all your friends and loved ones. Enjoy! Hi LJ! Yes u are my first commenter for this post, yay! Selamat Hari Raya Aidilfitri - Maaf Zahir Batin! hey you know what.. kalau you craving sgt, mai lah rumah i, raya mah, makan rendang dan sambal with nasi empit. Ketupat tak buat lah tahun ni..
Selamat Hari Raya! Hope you enjoy the holiday. btw, I've another tag for u.
Marzie, Selamat Hari Raya! How was Raya Celebration? Any raya pics? oh, did u make the sambal? Very sweet. I love the contest Mariuca. I never win anything. Ooops. Negative thinking. ERase that. Power of positive thinking....I will win...I will win....I will win...your cup one day so I can look at your lovely face on my desk! Hula! Maklumlah, kami tengah sibuk visiting everyone in the whole family tree, it kinda took me a while to get here with my greetings. Thanks for the wishes and linklove dear! Happy Hari Raya to you too! Sorry for the delayed wishes. I was out of station for a very long time & reached home before 2 days! eh eh.. lagi tiga hari Raya! !